Glass & carbon fibre composites company. 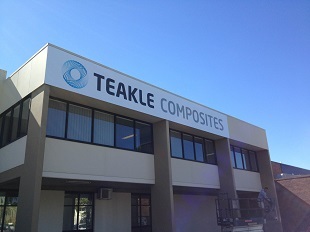 Teakle Composites, Australia. Teakle Composites was established in 2007 to develop and manufacture fibre composite products. Our composites activities started with building and testing fibre composite solid propellant rocket motors with the University of Queensland Mechanical Engineering Division. The remarkable performance of the resulting components prompted us to consider other applications for fibre composites and led to the formation of the company. As at August 2013 we have four mechanical engineers and several highly skilled technical staff. The industries we serve are primarily gas, drilling, mining and aerospace. We have an office/factory at 29 Colebard St West, Acacia Ridge. We are conveniently located just 12km South of Brisbane's CBD. The 200m2 of office space houses our administrative and engineering staff and visitors, while the 1100m2 of factory floor is where we receive, manufacture, test and despatch goods.